As many of you know, 2016 is a very special year for Cinema For All. Since 1946 we have been supporting, developing and championing the fantastic and inspirational work of the community cinema and film society movement in the UK. It’s time for us all to celebrate! From April 2016 to April 2017 we will be marking our 70th anniversary with a campaign to encourage people throughout the UK to take a trip to their nearest community cinema, film society, film club or pop-up. 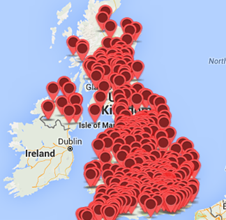 Are you on Cinema For All’s online map of community cinemas? Are your details up to date? Throughout the campaign we’ll be letting people know how easy it is to find their local group via our website, so make sure your info is correct. Email us on info@cinemaforall.org.uk if you have any additions or changes. Add your voice to the Come See a Film With Us campaign and show the world what community cinema looks like! 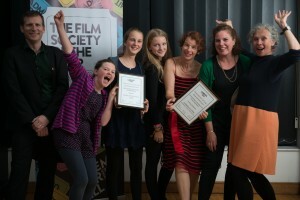 We’re encouraging all groups to make a 1 minute video to introduce your community cinema or film society. Include what you do and where you’re based – making sure you mention our campaign phrase ‘come see a film with us.’ Upload it to your social media accounts/website using the hashtag #cinemaforall and we will repost it from the national Cinema For All accounts. We want to share as many videos as we can to help spread the word about your brilliant screening activities. You can make your video as high quality or as rough and ready as you like. Spread the word via the power of radio! We’ll be using the power of local and national radio to tell audiences all about your fantastic screening activities. If you’d like to be involved by talking to your local station about the campaign, Cinema For All’s anniversary year, the power of community cinema, and your own activities, get in touch with Abi on abi@cinemaforall.org.uk and we’ll help you set up an interview. Make a donation so we can continue supporting community cinema across the UK. A donation of any amount can help! If you would like to get involved or have some ideas of your own of ways to help us celebrate, please get in touch. We would love to hear from you! Email us on info@cinemaforall.org.uk.